Главная » Новости » Новости музея » Lecture on 6 th of October: "Headwear of ancient Macedonian elite in the late IV B.C." The typical headdress for Macedonian elite was the Kausia, a type of rolled-up felt-cap. This cap originated in Macedonia and became popular all across the Hellenistic world through the conquests to the East by Alexander the Great of Macedon. 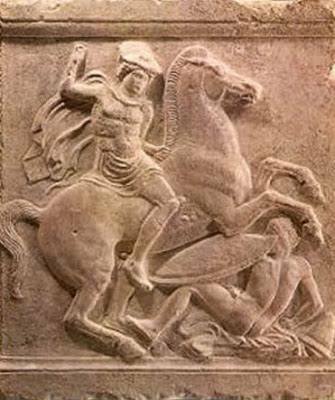 Its form and descriptions closely match the Pakol caps from modern-day Afghanistan, and it can be assumed that the Pakol cap is a successor of the Macedonian Kausia, which was brought to Afghanistan and Pakistan by Macedonian troops during the Macedonian conquest. Lecture is delivered by George G. v. Durtanosky* - visiting Professor and Head of Scriptorium (Latvian Christian Academy).